The best open secret is how well pizza pairs with wine. It brings out the nuances of the wine, the complexity of the cheese and the sauce, and the freshness of the organic, freshly-milled flour. At Mulino Italian Kitchen & Bar, we are pleased to offer wood-fired pizzas and incredible wines from around the world. We put a unique spin on a classic favorite! Enjoy one of our wood-fired pizzas that are not only organic but also made from fresh, local ingredients including Lindley Mills flour. Choose from one of our specially crafted pizzas or make your own! 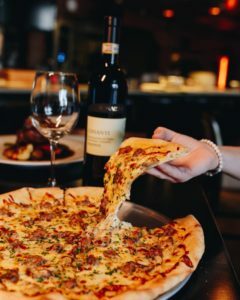 After you have chosen your pizza, let our talented staff help you select the perfect wine pairing or choose one of your favorites from our menu. At Mulino Italian Kitchen & Bar, we are excited to feature an extensive wine menu, focused on Italian estate vineyards including reds, whites, Lambruscos, sparklings, rosés, and more! Our wine selection is constantly changing. Please call 919-838-8595 if you would like to make sure a specific wine will be available for you. We Look Forward to Seeing You for Pizza and Wine Soon! 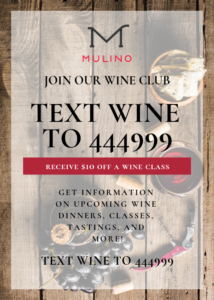 If you enjoy learning about wine, trying new wines, or just enjoy drinking with new friends and old ones, we would love for you to join our Wine Club! Joining is easy, just text WINE to 444999 and you are in. From there, you will receive information on upcoming wine dinners, classes, tastings, and more. These events usually sell out fast but you will have the first opportunity to sign up or purchase tickets. If you sign up now, you will also receive $10 off a Wine Class.